We are always in need of Day Camp Volunteers! Camp Fire relies on our amazing adult and teen volunteers to make the magic of Day Camp happen for kids each summer! Volunteering is easy and fun and the best part – making a difference in the life of a child! All LEAD (9-10th grade), Teen Counselor (11-12th grade), and Adult volunteers are required to attend two mandatory training sessions prior to camp. ONSITE training: Each week of day camp has its own specific Onsite training at that camps location. If you volunteer at more than one week of day camp, you are required to attend the onsite training for each specific day camp location. Onsite training dates are listed on our council calendar and are also displayed during registration and on confirmation emails. Day Camp Training Dates are posted to our calendar as they are made available. 8th Grade: Spend the week as Counselors-in-Training (CITs) and gain valuable leadership experience. The CIT Program is available at all of our Day Camp locations. No prior experience is required. Not required to attend any training (offsite or onsite training) prior to the first day of camp. After successfully completing one session, 8th graders may register for additional weeks of camp as a CIT2 and join the other teen volunteers in supporting camper groups and activity areas. 9th-12th Grade: If you are unable to attend the mandatory training sessions to participate as a LEAD or Teen Counselor, then you may register as a CIT. After completing one session as a CIT, 9th-12-grade participants may register for additional weeks of camp during the same season as Teen Volunteers. 9th-10th Grade: Join our LEAD Program and learn new leadership skills, help out at different activity areas, and support camper groups. 11th-12th Grade: Become a Teen Counselor and lead a group of campers! Or lead an activity area! Camp Skills 101 workshops – 2019 dates coming soon! Can’t wait for summer to start? Teens entering 9-12th grade join us for a day of camp fun! 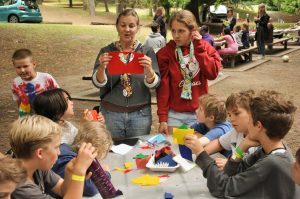 Camp Skills 101 workshops coming this June to Woodland Park and Gold Creek. There is a need for many different skill sets at Day Camp! Adults can volunteer at any of our Day Camp sites except for Camp Sealth as counselors, activity specialists, purchasers, equipment managers or health care managers. Full-time adult volunteers get a $100 discount on day camp registration for their own children. Children of full-week adult volunteers will automatically gain entrance into the camp of their choice and will be immediately taken off the waitlist. Camp Site Director: You’re a fearless Day Camp Leader! The Camp Site Director is responsible for total operation of Day Camp, assigns responsibilities and gives general supervision to all volunteer staff. Assistant Camp Director: Works closely with the Camp Site Director both before and during the Day Camp session, and assumes responsibility in the absence of the Camp Site Director. Health Manager: A medical professional or a certified first aid staff who is responsible for the dispensing of all first aid and medications, and for seeing that good health practices are followed, and for keeping the health records. Equipment Supervisor: This role is incredibly vital to a fun Day Camp, as everyone loves to play games, cook food, and do all sorts of fun things that require equipment! Responsible for checking equipment in and out and seeing that it comes back from groups each day in good condition, ready for use. Purchaser: Are you ready for some tasty Day Camp favorites? The Purchaser plans and buys supplies for Day Camp including food. Commitment includes shopping prior to the start of camp, store runs during camp hours, storing and sorting food items. Program Staff: A Day Camp Utility Player! Assist with pre-camp training by teaching their skills to Unit Leaders and Counselors and by informing them of the program resources and equipment which can be made available to groups. During Day Camp, they assist units and groups as requested. They select and procure special program equipment after given authorization by the Camp Site Director. Activity Specialist: Do you have hidden talents or favorite hobbies? Instruct, teach or lead activities to our Day Campers such as crafts, field games, science, nature hike, fire safety, outdoor cooking and more! 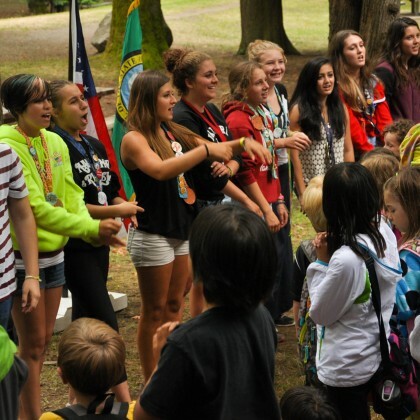 Contact Kerrie Sampelayo, Day Camp Manager, at (206) 826-8941 or kerries@campfireseattle.org.